This trick is fun and very easy to do. Two cards are selected from an ordinary deck. Three Easily Influenced cards then duplicate the value of the first selection, before instantly changing to match the value of the second selection. A moment later the cards are all red, then instantly, they change to black. Finally, each card becomes totally mixed up in an amusing climax. Easy to reset to perform again and again. 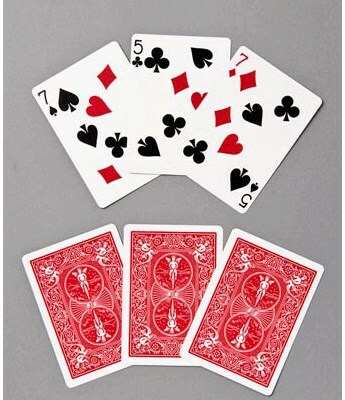 To bring you the very best quality magic, we have had these special Easily Influenced cards printed exclusively for us by the United States Playing Card Company on red, Bicycle Rider back cards.